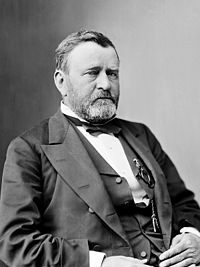 Ba é Ulysses S. Grant (27 Aibreán, 1822 – 23 Iúil, 1885) an 18ú uachtarán Stáit Aontaithe Mheiriceá agus laoch cogaidh. Bhí sé i bhfeidhmeannas ón 4 Márta, 1869 go dtí an 3 Márta, 1877. Bhí Ulysses Grant ina ghinearál ar na fórsaí an Tuaiscirt i rith Chogadh Cathartha na Stát Aontaithe. Nuair a d'éirigh le Grant Vicksburg a shealbhú in Iúil 1863, bhí abhainn Mississippi faoi smacht an Tuaiscirt, agus críocha an Deiscirt scoilte. 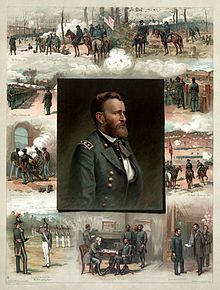 Chuir Ulysses Grant sraith de chathanna fuilteacha ar Robert Lee i Virginia i rith an tsamhraidh 1864. I rith na bliana 1864, tháinig an chuma ar an scéal go raibh an cogadh ag teip ar an Deisceart, ó bhí an Tuaisceart i bhfad ní ba láidre ó thaobh na heacnamaíochta, an daonra, na tionsclaíochta, na geografaíochta, na heagraíochta polaitiúla agus an chórais iompair de. Bhí Lee ábalta é féin a chosaint agus an-damáiste a dhéanamh do shluaite Grant, ach ní raibh saighdiúirí úra ar fáil do Lee ina n-áit siúd a básaíodh air i machaire an áir. Sa bhliain 1865, thit an tóin as an gCónaidhm, nuair a ghéill Lee do Grant i dTeach na Cúirte in Appomattox. Tugadh an leathanach seo cothrom le dáta an 23 Iúil 2017 ag 12:43.